Thomas Dowling, a senior at the University of Illinois at Urbana-Champaign, is the first Rhodes Scholar on the Urbana campus since 1998. 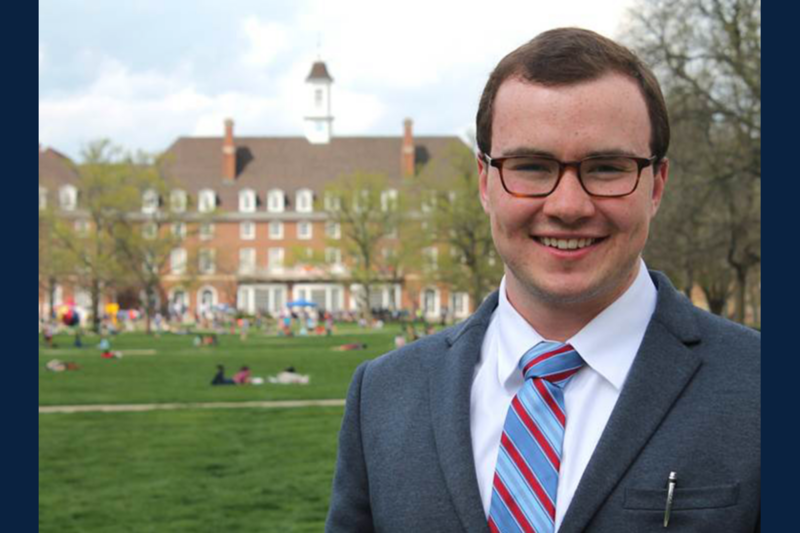 CHAMPAIGN, Ill. — Thomas Dowling, a senior at the University of Illinois at Urbana-Champaign pursuing a double major in political science and history, has been named a Rhodes Scholar. Dowling, of Chicago, is one of 32 students from the United States selected as Rhodes Scholars for postgraduate study at the University of Oxford in the United Kingdom. The first Rhodes Scholar on the Urbana campus since 1998, Dowling is poised to become the first in his family to graduate from college. He is a James Scholar honors student with a 4.0 GPA. Dowling is interning at the Institute of Government and Public Affairs investigating the state of Illinois pension system’s structural deficits. Dowling co-founded the campus’s speech and debate team; educated Illinois students about fiscal policy as a campaign manager for Up to Us; founded an Illinois chapter of the American Enterprise Institute Executive Council; and created a nonprofit organization, YOUTHink Politics, that seeks to educate and engage high school students to become part of the political process. Dowling also has gained extensive experience in both local and national politics. He campaigned for and then served as state Rep. Carol Ammons’ deputy chief of staff, and was appointed to the Champaign Zoning Board of Appeals. He served as a media consultant and organizing fellow for the Bernie Sanders presidential campaign and also interned at the Center for American Progress in Washington, D.C., where he worked on rapid-response research and communications projects. Dowling also spent a semester as a Center for Strategic Research intern at the AFL-CIO, constructing strategies to help workers unionize and get more involved in the political process. At Oxford, Dowling plans to pursue a master’s of public policy. He previously was named a Truman Scholar for his dedication to public service, academic excellence and leadership. Long-term, Dowling aspires to represent residents of his home district on the South Side of Chicago, and to get them and others more involved in the political process. Editor’s note: For more information, contact David Schug, director of the National and International Scholarships Program, University of Illinois, at (217) 333-4710 or topscholars@illinois.edu.